Welcome to the first edition of 21 Free Printables! 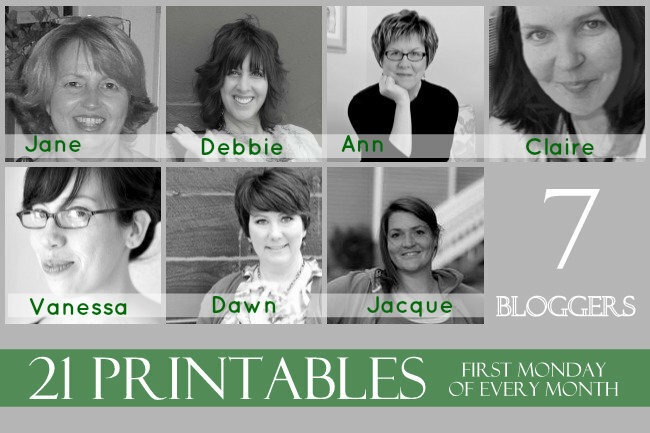 I am teaming up with 6 other bloggers to bring you 21 free printables all accessible from my blog. We will be posting on the first Monday of every month. I’ve had a sneak peak at a few of them and let me tell you…they are incredible. You can find them below in the closed link party. June is busting out all over Ohio. My knock-out roses are going crazy and I have blooms on my peonies. I am grateful for so many things…not just the blooms on my flowers. I’m filled with gratitude for every one of you. You have made this blogging adventure so much fun…thanks for stopping by! Creative, Ann, and generous. Thank you. Great printables, thanks so much! These are wonderful Ann, thank you so much for sharing!! Thanks Ann I love printables! I am printing out the black and white one right this second! Pinning because everyone needs a reminder! The color options are awesome!!! Those are all great! I have printed the one with all the Garden words and a Ball jar. I hope you had a good weekend, dear Ann. Love your three printables Ann!! Once all are up I am creating a roundup collage to post all over the place!! Ann, I love all 3 versions of your printables! I had the same teacher in 1st, 2nd, and 3rd grade (didn’t go to K) and she had the golden rule posted in her room. She referred to it frequently and it made quite an impression on me. I have tried to model my personal and professional life after her because she LIVED the golden rule. But some days it’s harder than others to follow. Congrats on getting the photo accepted!